An ambigous dinosaur due to its small size, Nanotyrannus was declared a new genera relatively long after its fossil was found, considering how much was found. The main restraint was a debate over whether it was an actual separate genera or simply a juvenile Tyrannosaurus. In some respects Nanotyrannus was the late cretaceous tyrannosaurids' answer to dromaeosaurids. 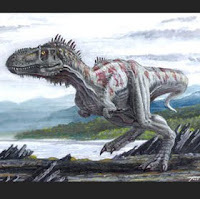 Able to change direction quickly & sprinting at 30 km/h, Nanotyrannus was sprightly in comparison to its larger cousins. While Nanotyrannus is considered by most of the scientific community to be indeed a tyrannosaurid, some dispute this fact, saying it may be in fact a large dromaeosaur, comparable in size to that of Utahraptor & Austroraptor. Nanotyrannus may have hunted in packs, a concept supported by the discovery of teeth found in a well-preserved Triceratops fossil. Too many were found to come from one animal, suggesting the Triceratops was either killed or scavenged by multiple animals of the same species.